I love Portillo’s chopped salad. Portillo’s is a fast food chain in the Chicago area. If you ever visit Chicago, I highly recommend checking out Portillo’s. Indulge in a hot dog and fries and go back a second time to try their chopped salad! I’m pleased to share this copycat recipe with you. It takes forever to chop up the ingredients, but it’s worth it. I ended up quartering the recipe and I had enough for 2 HUGE salads. 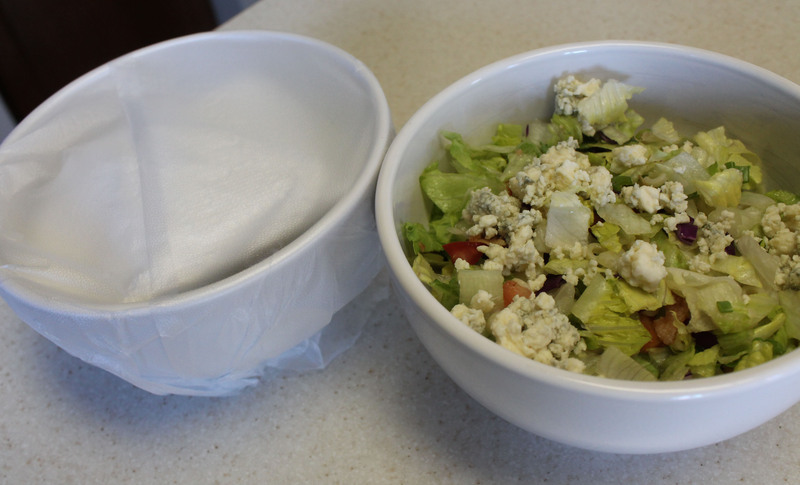 Save the second salad by placing a paper towel over the salad and covering with plastic wrap. The paper towel helps absorb the moisture and keeps the salad fresh for the next day. This tastes just like Portillo’s chopped salad. 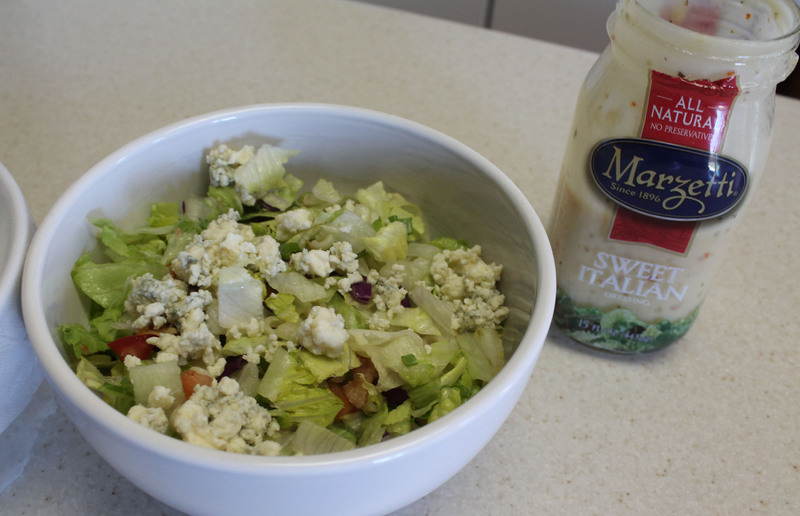 Also, I have tried out many salad dressings and the best match I could find was Marzetti’s Sweet Italian dressing. 1. Wash and dry the lettuces. 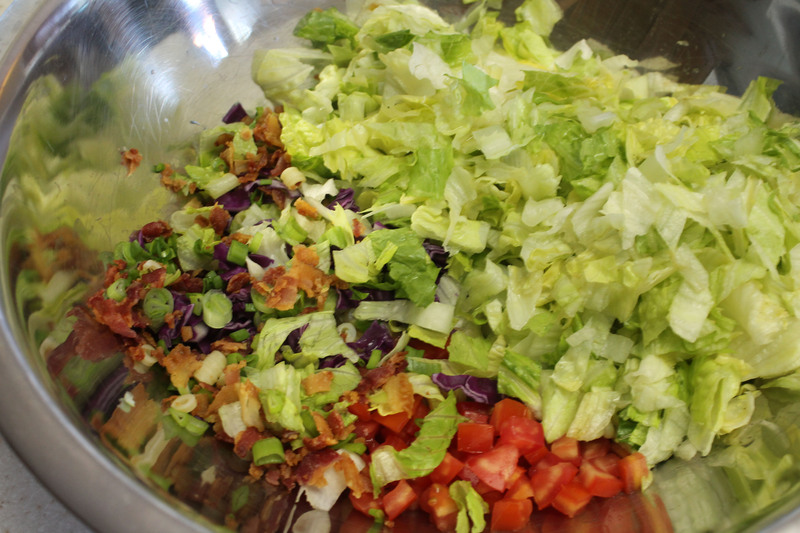 Finely chop until the lettuce is in small pieces. Put in a large bowl. 2. Add remaining ingredients, except dressing, and toss to combine well. 3. 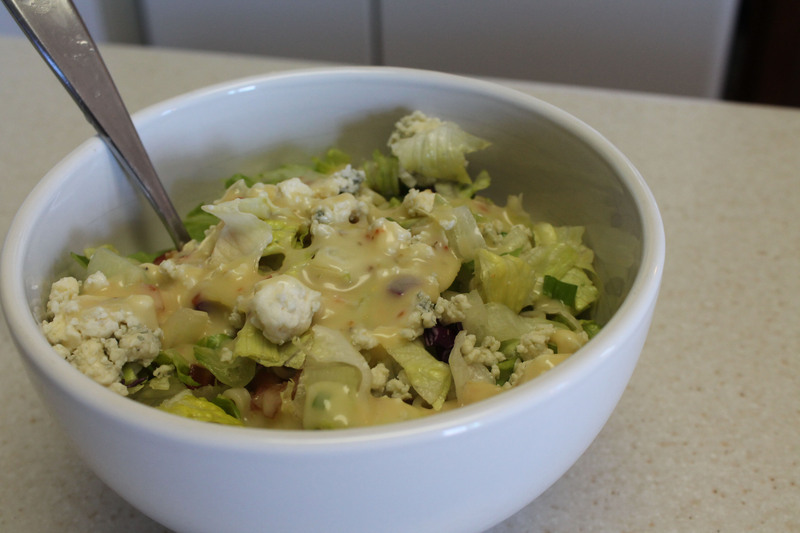 Serve dressing along side the salad or pour on and combine just before serving. The original Portillo’s Chopped Salad includes diced chicken breast, but we opted to leave that out to make it more picnic and side-dish friendly. I think I’ll be making this for just our family very soon and including the chicken. It would definitely be hearty enough to make a complete meal. Substitutions: I left out the red onion. Next time I will add chicken! Time: It took me close to an hour to chop everything up and clean up, including distractions from the kiddo’s. Weight Watchers Points: I calculated 8 WW+ points. I used 2 T. dressing. We love pizza and calzones at our house. 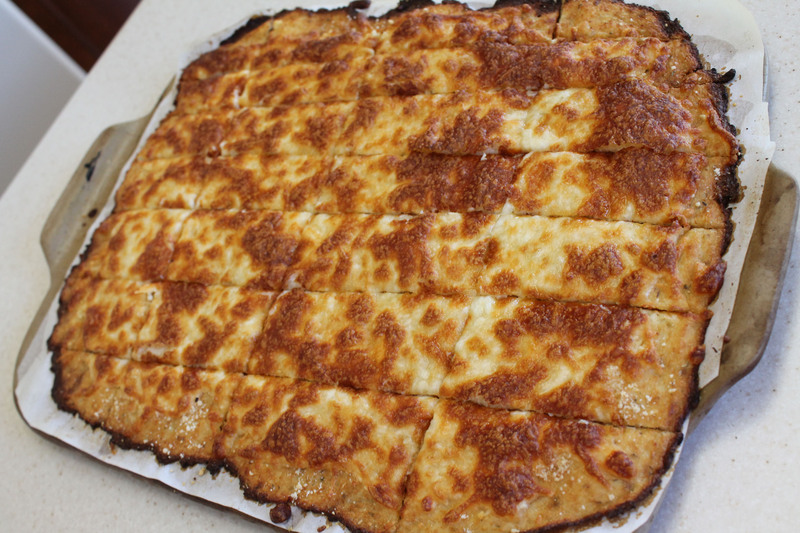 Really, we love anything with dough/bread, pizza sauce, and cheese. I saw this recipe on Pinterest and decided to give it a try! The calzone’s were very tasty! I got a little frustrated shaping the dough, but I got there eventually! 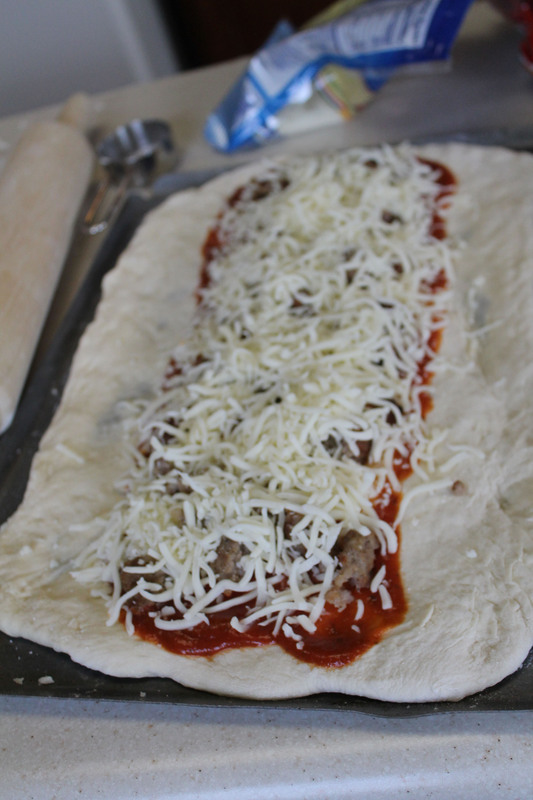 We filled our with sauce, cheese, and sausage. I look forward to making other varieties as well! Time: 30 minutes bake time, plus 15 minutes prep time (not including the time I spent rolling the dough, which seemed like forever). You’ve seen this recipe all over Pinterest. Since I was making lemon-lime cookie dough truffles, I already had the vanilla candy coating melted. Oh a whim, I pulled out some strawberries and sprinkles and finished off the vanilla candy coating. I brought these to my family’s 4th of July BBQ. They were a hit! 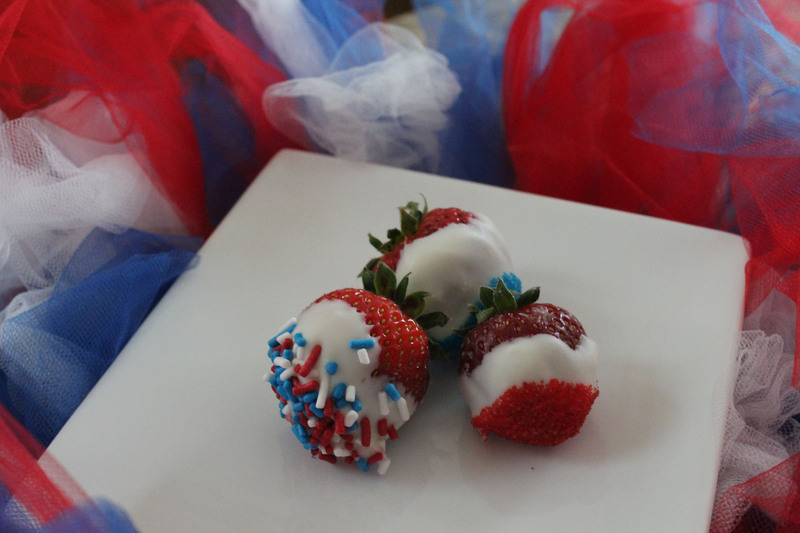 All you do is dip the strawberry in the melted candy coating (the coating sticks easier on dry strawberries). Then, dip in sprinkles. Once again, the sprinkles were my daughters job. Place the strawberries on a wax lined cookie sheet to harden and store in the refrigerator. Recipe: I didn’t follow a recipe. I just dipped strawberries in melted candy coating and then again in sprinkles. This is my new favorite dip! It is very quick to put together. The most time consuming part of this recipe is cooking the bacon. At first I was thrown off that this dip didn’t have any potato in it at all. 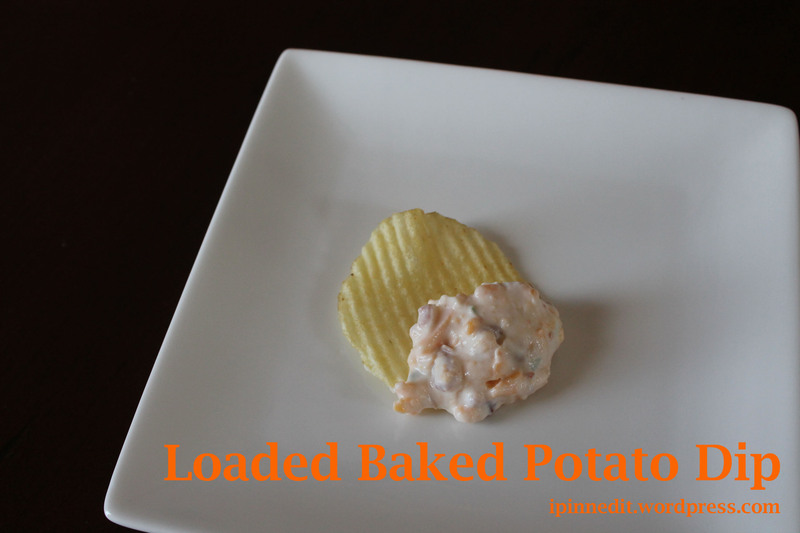 Ah ha… pair it with a potato chip (Ruffles are my fav) and there is your potato! Just dip and load it up! 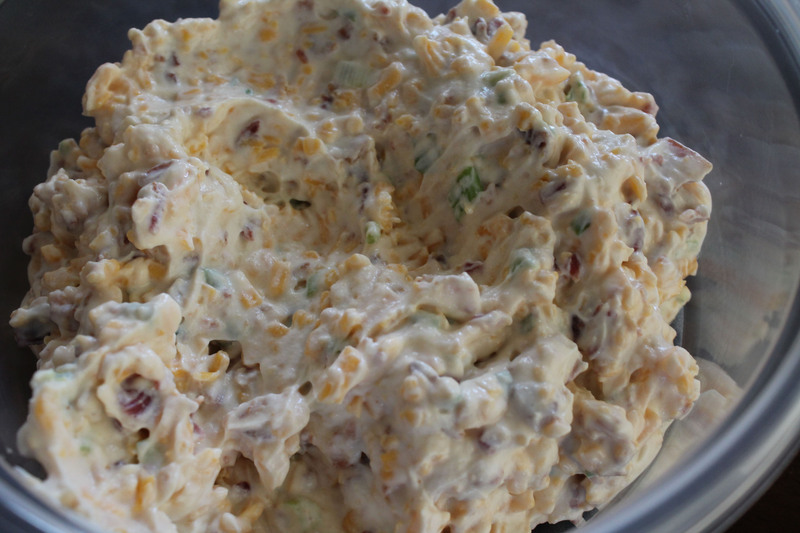 If you like onion, bacon, and cheese, you will love this dip! Substitutions: I didn’t have 16 slices of bacon, so I used 10. I used green onion instead of chives. It’s all over Pinterest these days, so I had to give it a try! I was super excited to try this recipe! How awesome would it be if it turned out and I had a healthier alternative for pizza! Well, it was good, but not amazing. So, I was disappointed. It tasted pretty good (not as good as regular pizza dough), but I do have a few complaints as you will read below. I pinned two different cauliflower crust recipes. 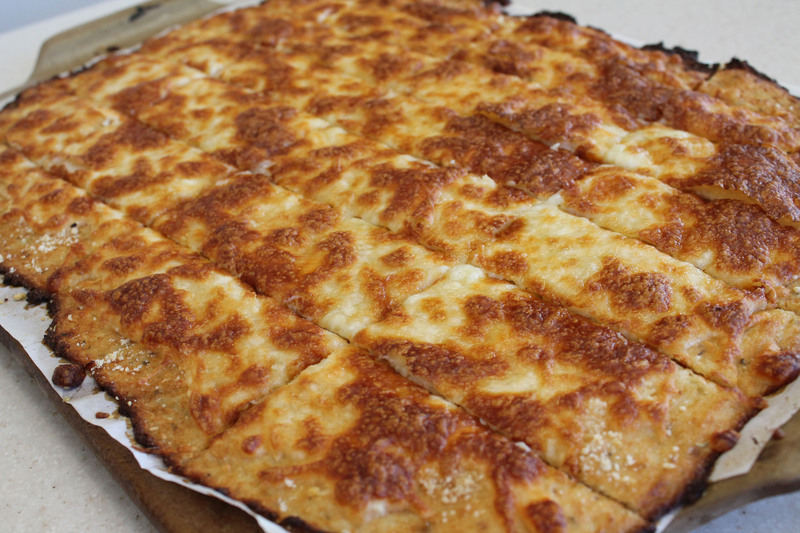 The first was for a cauliflower pizza and the second for cauliflower cheesy garlic bread sticks. 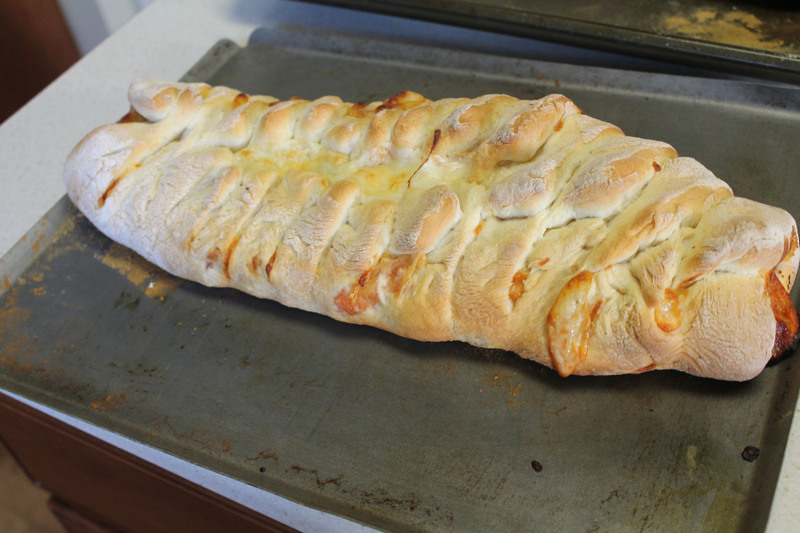 I made the bread stick recipe. I noted that the directions for the crust were different in the two recipes although they called for the same ingredients and measurements. The bread stick recipe said to steam the cauliflower and then use a ricer to create the riced cauliflower. I don’t have a ricer (nor do I know what it is), so I used the pizza recipe which said to use the food processor and then microwave the cauliflower. My husband doesn’t like cauliflower, so I decided to put this recipe together and keep the cauliflower a secret. Well, the overwhelming smell in the house gave me away! When I microwaved the cauliflower, the smell was very strong. Perhaps if I steam it next time, it won’t smell as strong?!? The house smelled for at least a day. For this one reason, I may not make it again! I like cauliflower, but when I went to bed and all I could smell was the microwaved cauliflower, the smell was just too much for even me. Also, I found that the crush was not crisp enough. Maybe if I don’t use parchment paper next time and lay the crust in a generously oiled baking sheet it would be crispier? 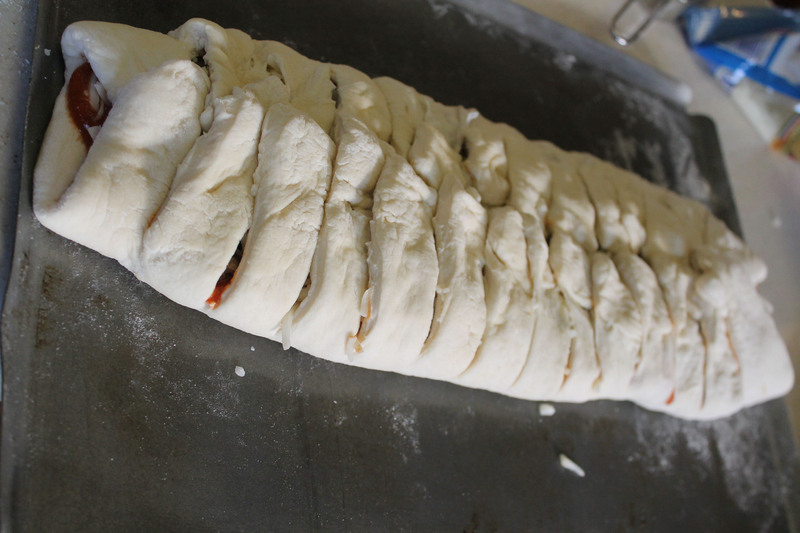 I did love that the dough was easy to thin out and held its shape unlike real pizza dough. I spread the dough too thin, so next time (if there is a next time), I would make a double batch and have a thicker crush. The recipe says that one head of cauliflower yields three cups of riced cauliflower; however, my head only produced 1 cup of riced cauliflower. I thought the crust tasted good, but I prefer real pizza dough. My daughters didn’t eat it, my husband didn’t eat it, but my sister and I enjoyed it. My sister said that she would make it again. I’m not sure if I will try again, but if I do, I’ll update this post with any changes I make. If you have made this recipe, please leave me a comment and suggestions. I’d love to try again. Did your house smell for a day? Did your crust come out crispy? Did you microwave the cauliflower? Did your head of cauliflower come out to only 1 cup of riced cauliflower? Thanks! Substitutions: I used the directions from the pizza recipe to make the crust. I grabbed some sweet corn at the grocery store the other day and decided to bake it! I’ve always boiled my corn or grilled it, but I’ve never tried baking it! I was attracted to the idea because it seemed easy, fast, and easy to clean up. I baked the corn at 350 degrees for about 40 minutes. Be careful when you peel off the husk because it was hot! I baked it on a baking sheet, but I will probably toss it right on the rack next time. 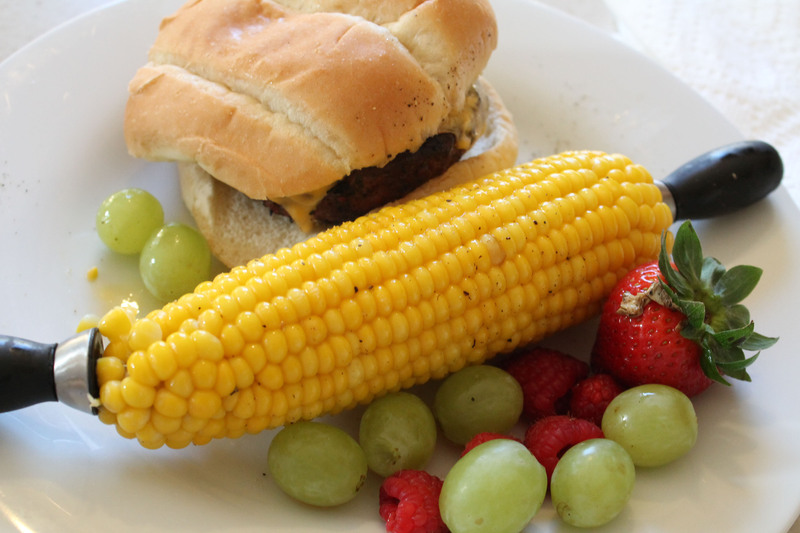 I paired the corn on the cob with a grilled pub burger and fruit. I garnished my corn with butter, salt, and pepper, and it was “oh so oh so good” as my daughter would say. Substitutions: After 30 minutes, my corn was still not done. I ended up baking it for 40 or 45 minutes! Time: There was no prep time except to toss the corn on a baking sheet. The corn baked for 40 minutes while I prepared the rest of the meal. These individual pizza’s were amazing! Every member of my picky family inhaled them! The best part is that they were very quick, easy, and inexpensive! I plan to make these again in other varieties such as taco pizza, alfredo spinach, and bbq chicken. The possibilities are endless. The recipe suggests using a generous amount of olive oil on the baking sheet. I followed directions and I’m glad I did. I think the oil made the crust crispier! You should try these out. Your family will love them. Time: I defrosted mine for 1.5 hours and then it only took 5 minutes to prep and 10-12 minutes to bake. Substitutions: My daughter doesn’t like “red sauce”, so she spread alfredo sauce on hers. I plan to make these again in other varieties such as taco pizza and alfredo spinach, and bbq chicken. The possibilities are endless.